This map: http://www.timeanddate.com/time/map/ shows that it's more of a mix than I thought. Generally 1 hour offsets, but with the odd exception. Eoink wrote: I've just realised that there is now a small group of people who will start measuring time in half hours. So the next time you meet someone who says "I'll be ready in 6 half hours" instead of "I'll be ready in three hours", just ask them what their xkcd forum handle is. That's not quite new - Glasen (German) for time measurement on ships was much like that. The hourglass had to be turned every 30 minutes; with the bell ringing eight times the 4-hour-watch shift was over (English wikipedia here). Lets say, Randall will continue 1190 "forever". How long until the forum traffic in this thread will subside to 1 post per hour? How long until less than 10 people are looking for updates on 30m-basis? How the hell is a countdown to a discrete event reliant on time-zones? Last edited by rpell on Wed Mar 27, 2013 1:55 pm UTC, edited 1 time in total. Line Islands: Those that are part of Kiribati are in the world's farthest forward time zone, UTC+14:00. The time of day is the same as in Hawaiʻi, but the date is one day ahead. The time is 26 hours ahead of some other islands in Oceania like Baker Island which uses UTC−12:00. Last edited by iisjreg on Wed Mar 27, 2013 1:28 pm UTC, edited 1 time in total. I love how the projection messes with the vertical time lines. The sectioned off bits around +12/-12 are incredibly confusing. Almost done with the new wall! Clearly this means that Randall has been diagnosed with psoriasis. higgs-boson wrote: Lets say, Randall will continue 1190 "forever". How long until the forum traffic in this thread will subside to 1 post per hour? How long until less than 10 people are looking for updates on 30m-basis? I don't think it's feasible that this will continue indefinitely at half-hourly intervals. Assuming (at a best case scenario) that it takes him 1 minute to draw the changes to a comic and upload it into the queue, he'd still have to spend 5 hours and 36 minutes drawing this comic every week for the rest of his life. It doesn't matter how much he has stockpiled: as the current queue runs out, the amount of time per week will approach that number. If it takes closer to 2 minutes, then he's spending practically an entire day of every week on this one comic. If the updates dropped to 1 (or preferably 2) hourly, then I could see it going on forever, but I think making assumptions of eternity based on less than 3 days worth of updates is a little premature! Perhaps he's written an algorithm to draw and upload this comic for him? If Randall had a highly developed artificial intelligence under his control, I suspect he'd be using it for more devious purposes than drawing an eternal comic. PS. I'm aware that 11 hours =/= 1 day. I'm allowing for eating, sleeping and occasional trips out of the house. How developed would it have to be to draw stick figures and sand castles in various states of building? The algorithm could do the bulk of the work, and Randall could manually draw bits and pieces here and there to make it seem more "human". Dracomax wrote: Or it's about how neat sandcastles are. that works too. 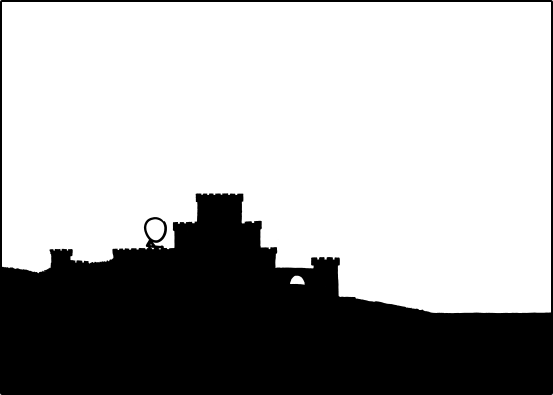 Also, is there anybody else who finds it strange that there is no mention of this comic/thread on the 'sandcastle' page on wikipedia? I somehow think there is a need for that. Hopefully I can stick to it. Just another thing Randall has thrown into our heads. To the people and the timezones, there are a few half hour timezones around indeed. And as just some trivia, the entirety of China is on one timezone GMT+8 (in line with Singapore). This means that in Beijing and Shanghai the clocks are roughly three hours slow (high noon in Shanghai is around 10am, the days start early (I know because I lived there)). Kind of strange considering they are on the same latitude longitude as Eastern Australia (where I am from). Just some of my life experience for you. SO CAPTIVATING. So much for sleep. Last edited by Fitzypyro on Wed Mar 27, 2013 2:15 pm UTC, edited 1 time in total. mojacardave wrote: If Randall had a highly developed artificial intelligence under his control, I suspect he'd be using it for more devious purposes than drawing an eternal comic. Knowing Randall's obvious intelligence and also extreme dedication to his work (seen in a great many strips of his that arent quite strips like click and drag, and the exponential scale now poster, and the internet maps now posters, and the gravity wells now poster, and the up goer five now poster, and the earth's depths now poster. and these are the ones i can remember off the top of my head) I would say it is very likely that he has the willpower to do this manually or could have created some form of complex image generation algorithm that would allow him to just keep going. mojacardave wrote: If the updates dropped to 1 (or preferably 2) hourly, then I could see it going on forever, but I think making assumptions of eternity based on less than 3 days worth of updates is a little premature! If you removed premature, unfounded assumptions about the nature of this comic from this thread, I'm pretty sure there would be about four posts in it. Last edited by blowfishhootie on Wed Mar 27, 2013 1:59 pm UTC, edited 1 time in total. Oh I love that. particularly because I'm still obsessed with cod4 and frequently try to set up tourneys with my friends/peers. This has just motivated me further to start up my newly planned one. There is still the hashing jargon that went on a while back. That would add up a bit. Still you have a point. Also sorry everyone for my bursts of posts every x amount of time. I just read up a bunch and then have lots of things to say. Also yay hes finished more of the wall! Considering I have to wake up in 11 half-hours I think I will be saying 'later' for now. 11 panels is a lot to miss!!!!! Fitzypyro wrote: And as just some trivia, the entirety of China is on one timezone GMT+8 (in line with Singapore). This means that in Beijing and Shanghai the clocks are roughly three hours slow (high noon in Shanghai is around 10am, the days start early (I know because I lived there)). Kind of strange considering they are on the same latitude as Eastern Australia (where I am from). Just some of my life experience for you. I hope you meant to say "longitude" rather than "latitude"
to be fair, I'm pretty sure that the unfounded assumptions are part of the point. How many people make unfounded assumptions of real life? it's part of the process of being sentient beings with the ability to experience only one point in a directional time. We can't really see what is coming, so we start making predictions based upon the past, our personal assumptions, and our mood. this comic just does the same thing to fans of XKCD as Real Life does to less geeky folk. I feel like a crazy person... I have a dedicated xkcd browser window now, with this thread, the countdown page (which BONGS), the original comic page and aubronwood's page (deffo the best thing EVAR) - Four tabs for one comic that ONLY EVER EVEN UPDATES ONCE EVERY HALF HOUR. I do honestly feel a little insane. However when I woke up this morning my face must have been a picture as I watched (on aubronwood's page, as slowly as I could bare to let myself scroll through the pictures) Megan leave, and then the boy finish, and then ACCIDENTALLY DESTROY the castle. We are surely nearing the end of the rebuild now, and Megan MUST return. Especially since he did!! Gosh. Three days of my life. A blur. Hey, that's not entirely true. I've been plugging the explainxkcd wiki for well more than four posts, even though our servers are having a hard enough time already without incoming visitors from these forums. My boyfriend is coming to pick me up in five-half-hours. I wonder if Megan will be back by then? I wonder where we will be? I almost don't want to sleep tonight because of this darned comic!! Gosh. Just to be clear, I didn't mean my post to be a criticism of all the speculation, more like, "why stop with the off-the-wall hypotheticals now?" It is for the most part fun to read (some exceptions). Last edited by blowfishhootie on Wed Mar 27, 2013 2:08 pm UTC, edited 1 time in total. It seems like the coding of #1190 has been slightly modified to obscure the URL. We're going to have to be careful from here on out to make sure we grab all of the images! Anybody who's written a code to directly grab the image URL from xkcd and link to it may have issues keeping their programs up to date. Downloading the image still seems to give the full filepath - currently at least. EDIT to add the latest update, since nobody has yet. I don't see why you would allow that for Randall when we clearly aren't doing any of those! mojacardave wrote: It seems like the coding of #1190 has been slightly modified to obscure the URL. We're going to have to be careful from here on out to make sure we grab all of the images! <plug>Or you could come see our archived records on the explainxkcd wiki, lovingly hand-crafted and time-stamped for your convenience! squonk wrote: How developed would it have to be to draw stick figures and sand castles in various states of building? The algorithm could do the bulk of the work, and Randall could manually draw bits and pieces here and there to make it seem more "human". Or perhaps this comic is the product of a number of years of work? There could still be hundreds of unserved hand-drawn images 'in the queue'. Perhaps (even) it was lovingly constructed in the form of a .gif, one layer of which is served up to us every half hour, only to be stuck back into another .gif - now there's poetry! davidy22 wrote: <plug>Or you could come see our archived records on the explainxkcd wiki, lovingly hand-crafted and time-stamped for your convenience! So long as you're uploading images and storing them on your own servers, that may be safer, once the mad rush has died down. It's entirely possible that Randall might run this once, and then remove all of the component images from his server.